New album finds Brouwer musing on love, faith and marriage . 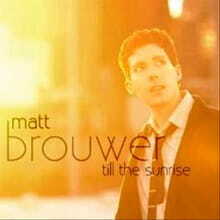 . .
Indie singer-songwriter Matt Brouwer has a lot to be grateful for these days. His new album, Till the Sunrise, was funded by fans via Kickstarter, and it’s dedicated to his new wife Hannah, whom he married in 2010. The songs are a reflection of the award-winning Canadian’s devotion to his grassroots following, faith and his new commitment of marriage. Songs like “Everlasting,” “Tonight” and “Ocean” affirm Brouwer’s songwriting is inspired by Scripture. His dreams, hopes and anxious fears are laid bare in the honest lyrics of these tracks, yet his answer clearly lies in the hope of Christ and the promise of unfailing, perpetual love. “Love Can Find a Way” is a wistful track featuring the dainty vocals of Brouwer’s recent tour mate and indie darling JJ Heller. “Outside, Inside” closes the album with a Michael Bublé-esque song that sounds more like a dream than reality. Its romantic musical landscape takes on a blurry mirage fitting the artful lyrics. His songwriting will now forever be changed as a result of his life’s most significant moments to date—his commitment to Christ and his commitment to his wife. Till the Sunrise undoubtedly reveals Brouwer writing through a new lens, and the result is a solid pop effort that accurately reflects Brouwer’s current stage in life—a mark of a talented songwriter.